A far cry from Chabrol 's great works. Patricia Highsmith's "cry of the owl" was not her best or even among her best,we are far from triumphs such as "the talented Mister Ripley" "Ripley's game " or "strangers on a train".But it was an interesting psychological study,focusing on a man who thought that, whatever he might do ,he was bound to fall andhe would even bring bad luck to his human pals.Like a lot of HIghsmith 's characters ,he was a neurotic,who could not fit in the "normal world" ,with a heavy guilt feeling and a touch of masochism.Chabrol's screenplay is very faithful to the novel,keeping even the last line,but it's a good example of how accuracy leads to failure. The choice of Christophe Malavoy was excellent because the actor is subtle enough to convey such a despair .But Chabrol put him against a gallery of weirdos which would drive any man insane:a brunette whose behavior is completely implausible,played an unconvincing actress,Mathilda May,a vulgar and unattractivewife -Ah Stephane Audran where are you ?- ,a brute of a fianc� who seems even more irrational than the hero,it's the last straw!On the paper the hero's thoughts and frames of mind made up for the implausibilities of the play and built an atmosphere of ambiguity ,an ambiguity which is almost totally absent in the film,in spite of Malavoy's commendable efforts.To top it all,there's an irritating part of a cop (Kalfon) ,a la Colombo,gobbling up madeleines ,and hinting at Marcel Proust as he tries to remind his unusual suspect of what he may have done. Because,like in a lot of Chabrol movies,people eat in in "le cri du hibou".The hero and his lady friend treat themselves to some delicious cr�pes suzette (flamb�es) and cassolettes of langoustines:the neurotic is also a gourmet !And he does love the girl's home-made cookies! 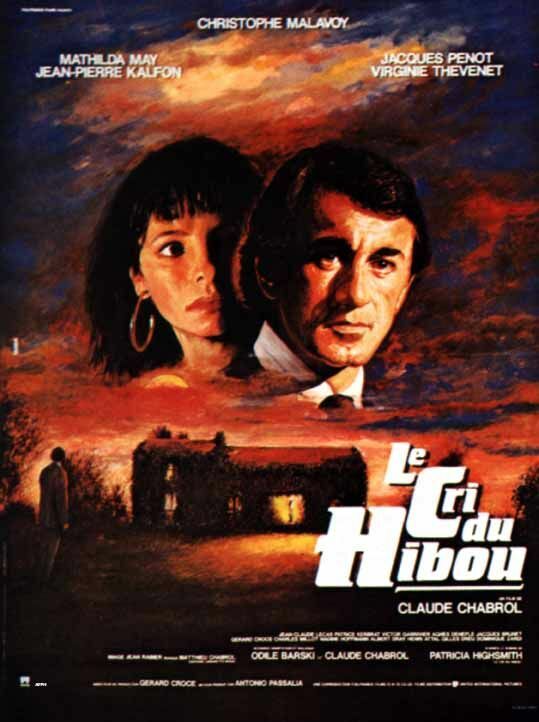 Doing two movies a year,Chabrol makes frequently spotty works:such was the case of "le cri du hibou" , deservedly forgotten work,whereas the contemporary "masques " -released at the beginning of the same year- was a brilliant film noir turned almost farce.